TO HAVE AND TO HOLD WEDDING PARTY! Hosted today by my dear Texas Friend, Stephanie of Angelic Accents. This is the second year for Stephanie to host her wedding party and what a terrific hostess she is. Be sure to visit HERE for the list of the participants. It is sure to be fun and memorable. This is my second year to participate in the party and many more times I have shared my very own wedding in pics and story. I am linking my past party post to this post and you can visit by clicking HERE to see my special wedding day. Weddings are wonderful, and in today's world, weddings are celebrated in many different ways. From specially themed events to simple and elegant affairs. From the beautiful vows said traditionally, to special words written by the loving couple. However, you can see in vintage photos, just how much has changed. Look at this photo and the couple way up at the top of the frame. They seem to be talking and in their own little world at the moment the photo was taken. I guess they got tired of waiting for the picture to be taken. 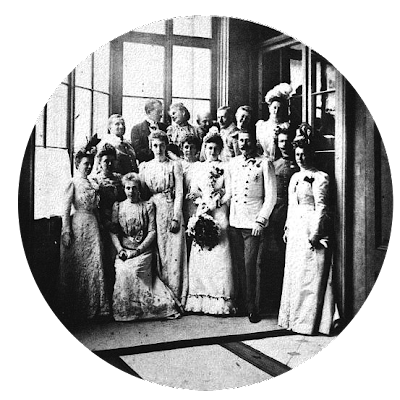 The main focus of course is the dress and the bride, the groom and attendants. In this next photo it appears the mother and mother in law are in the photo. One has a bouquet, the other does not. And, one little lady is trying to get into the picture, but was cut off. How about these bridesmaids hats? They look dark heavy and hot! Below are a few pics that speak for themselves. 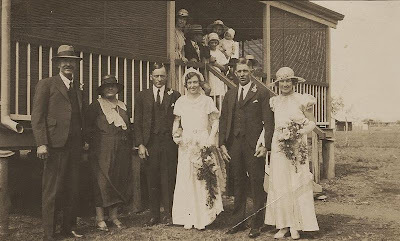 Wedding pics sure have changed over time. Not many smiles back then, as it took so long to take the pics, they just had to stay still in a somber pose or their face got tired from smiling for so long. Men did a lot of sitting in pics, while the bride stood. 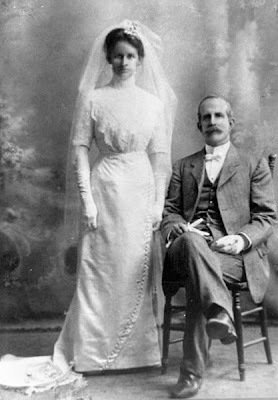 Maybe the bride feared the dress would wrinkle. Many looked wrinkled anyway! Some brides that did sit, were in the photo alone. These two brides sit alone. 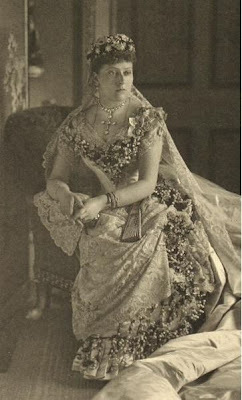 The first pic is Princess Beatrice from her wedding day in 1885. Now this groom gave his bride the seat! Whether a wedding was celebrated in grand style with many quests or in a smaller manner with a few close friends and family, all weddings are days to remember and a special time in life. Then and now, I am sure the emotions were the same. Vintage photos courtesy of The Graphics Fairy and Wikimedia Commons. I enjoyed the collection of wedding photos and you were a Beautiful Bride! I have to agree with Honey, you were a beautiful bride! Thanks for sharing all these photos. I always wondered why in vintage wedding photos, do the people always look so unhappy? You look so gorgeous in your beautiful wedding dress and I LOVE the photos--thank you so much for sharing your happy occasion with us...and big congratulations on 30 years together!!! It is wonderful AND a precious blessing. My dear sweet Celeste, I just had to visit your sweet blog before leaving the computer tonight. I have poured over both this post and your last year's post, too, again. Such amazing photos of you, L, and your precious parents. And I so love that you took the time to find some vintage photographs to share. 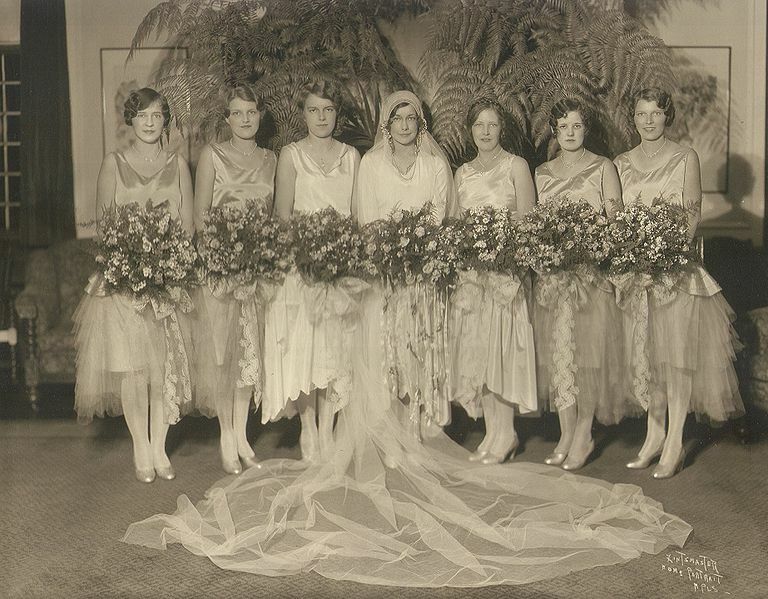 I always enjoy the fashions of the day and those ginormous bouquets! Did you notice the rug placed beneath the bride in one of your outdoor pics? Guess that was to help keep her hem clean. You were a beautiful bride, absolutely princess perfect in your stunning, billowy gown! Thanks for such a special post and for being such a special friend always! 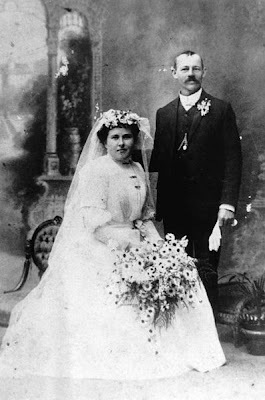 I adore the wedding dresses in your vintage photos! And your own wedding dress was beautiful! 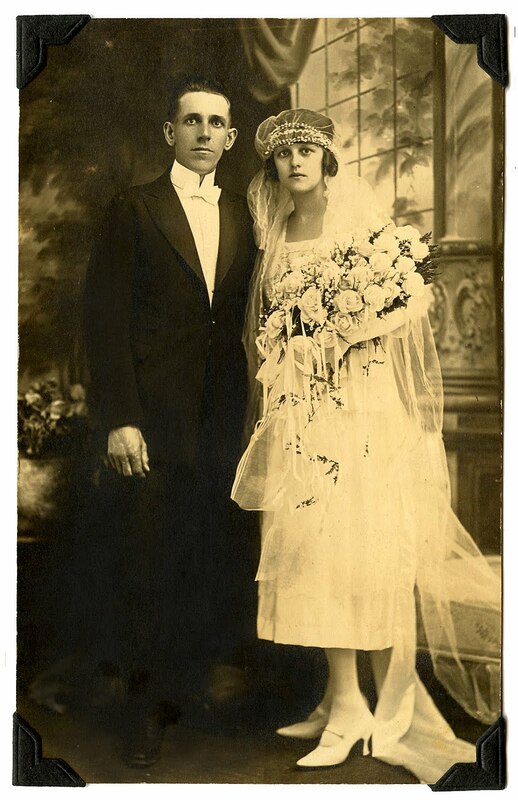 Hi Celeste, so fantastic vintage photos! True love is forever Happy Anniversary! 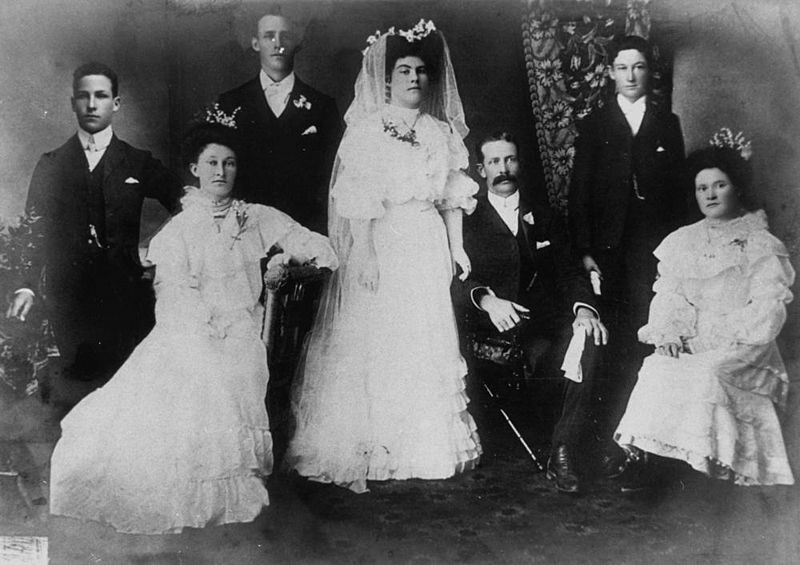 I just love all these wonderful old wedding photos. It is so fun to look at them, paying attention to all the little details! Thank you for sharing! Wonderful old pics! The weddings back then seems to elegant and so very formal. I sort of miss those days! Looks like you had a fairytale wedding...wonderful memories! 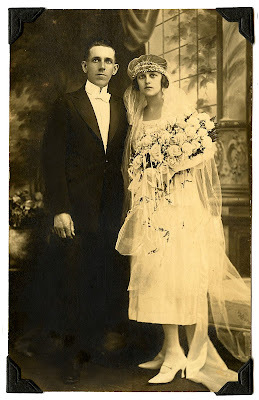 I love the vintage wedding pictures too, the styles and people are so interesting. Hope Blogger fixies itself again! soon so I can follow. Our 29th anniversary is August 14th.. Awesome post!! I liked looking at the vintage photos, and your commentary on them!! You were such a beautiful bride!! You and your husband look so happy!! Our anniversary is August 12th!! 33 years!! Oh boy I can see I will using quite a bit of tissue today! Your wedding post is so beautiful. I went back to your very special day. You were such a beautiful bride! And what a wonderful man you married! To plan such a romantic celebration for your anniversary is just the sweetest thing ever! Thank you so much for sharing. Congrats on 30 years! That's fantastic! You were such a pretty bride. Love all the vintage photos! Happy anniversary! Here's to many more happy years. p.s. I know it's an early salutation but I believe in celebrating those milestones! I'm swooning with joy! You were gorgeous as a young girl and are STILL GORGEOUS TODAY! I wanna know your secret RIGHT NOW! What an exquisite Texas bride beauty you are sweet Celeste. You look just like a princess, & look at your handsome groom. So enjoyed all these vintage photos. There is something about the olden day brides ... just gorgeous. So enjoyed, as always, my time with you. You are more radiant today than ever! I enjoyed all the pictures of weddings and especially yours! What a beautiful young woman you were and beautiful now! You have such a pretty smile! Hello Celeste, thank you so much for stopping by and leaving such sweet comments. I stopped by to see your post last night when I finished up with posting mine but it was storming here and our lights were blinking off so I thought it best I get of the computerer. 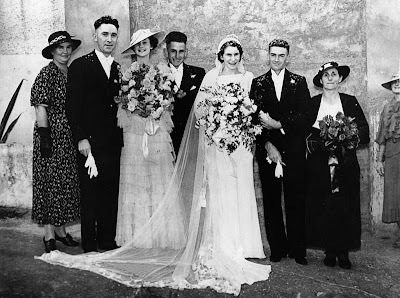 Your post is beautiful, I enjoyed looking at all the vintage wedding pictures. Your wedding gown was just stunning and you and your husband are a beautiful couple! Have a wonderful weekend! What a beautiful collection of photos! Your wedding dress was gorgeous and you and your husband looked so blissfully happy. Congratulations on almost 30 years! Thank you so much for telling me about this wedding party, I enjoyed it. 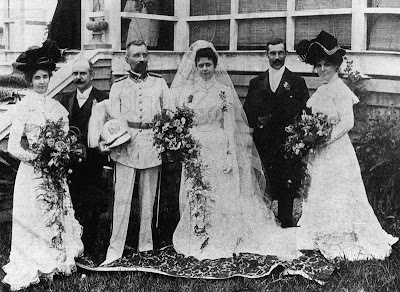 Isn't it wonderful to see how the wedding dresses have changed in all the old photos? 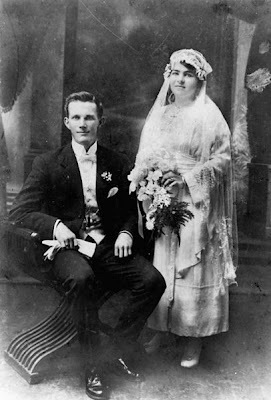 Went to see your wedding photos also, great memories to have for always, you were a lovely bride and had a handsome groom. I love your collection of vintage photos! 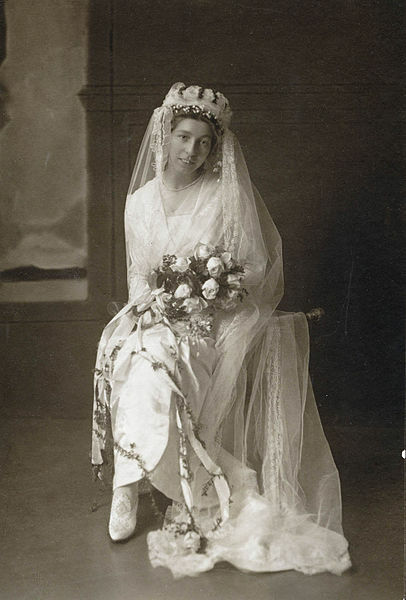 You certainly were a beautiful bride; I love your veil! Most brides don't wear the big long veils anymore, which I think is a shame! You were a beautiful bride, and congratulation on 38 years! 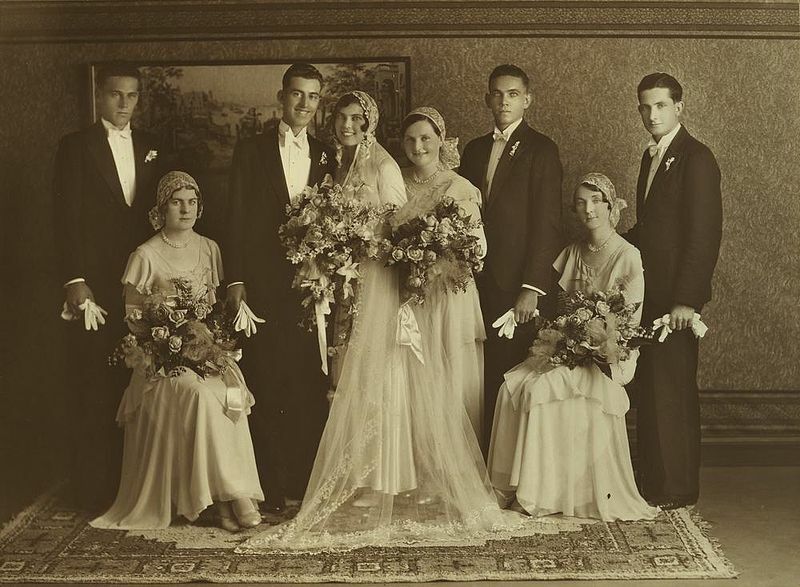 Love this great collection of vintage wedding photos. Your wedding was very beautiful and remember seeing photos before. It is such a special time and a day that you will always remember. I know I do, of my wedding day. 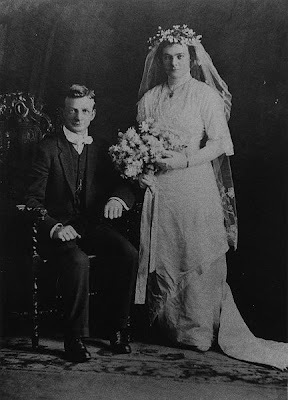 I love all the wonderful old wedding photographs you have shown and wasn't it interesting the way the gentleman always sat and the lady stood and yes, not a lot of smiling back then. Hope that you have a lovely weekend. What a beautiful bride you were the first time and the second at your renewal! 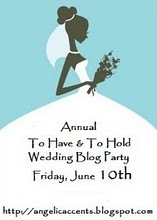 Happy Wedding Blog Party!